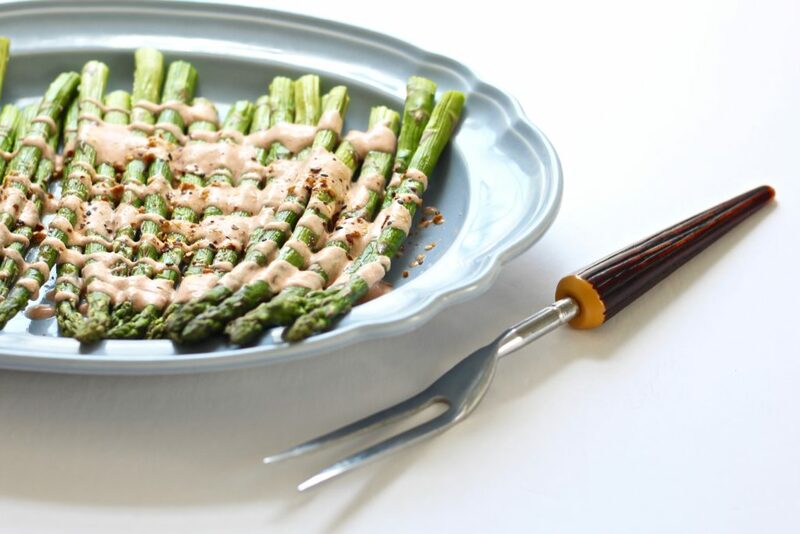 If you want to fancy up your asparagus using a few ingredients you may already have on hand, roast or steam the spears and drizzle a pretty sauce just before serving. Yogurt? Check. Lemon? Got it. Smoked paprika? What, you don’t have smoked paprika? It’s every cook’s secret ingredient for giving meals a special something. Dips and spreads, salads and dressings, grilled meats and seafood, scrambled eggs – all benefit from a shake. All you need is a little, and if you use the hot smoked Spanish paprika, watch your shaking behavior lest you end up with overkill for the tastebuds. Smoked paprika is also a game changer for vegetarians and vegans who miss out on smokiness with bacon avoidance; this spice lends the smoke without the meat. Lemony yogurt sauce with smoked Spanish paprika, and shichimi togarashi for sprinkling. You need very little olive oil to coat the asparagus and very little time in a hot oven for perfect, very slightly crisp spears. I roast mine for eight minutes because I like a bit of crunch; add two more minutes if you like tenderness. 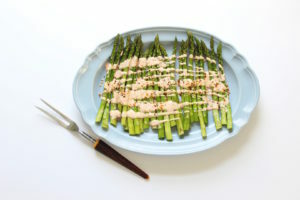 A word about asparagus here : everyone prizes the super thin spears except most folks in the cooking world who recognize that meatier spears yield more flavor. I look for the fattest ones, but generally have to make do with medium, the compromise local vendors and grocers offer for popular tastes. For make ahead magic, you can roast the spears the day ahead and then drizzle the yogurt sauce just before serving. The sauce will keep in the fridge for several days, so this dish is an easy showstopper, with its pretty colors and spring appeal. I like to sprinkle a peppery spice blend for another layer of texture and explosive flavor. Not too long ago I was gifted with a jar of shichimi togarashi, a Japanese spice blend with citrus and peppery notes. It’s difficult to find in stores, but the folks at McCormick’s spices have a recipe that approximates the taste and texture. If you have a chunkier pepper blend, like garlic pepper or lemon pepper, use this instead. In small bowl, mix yogurt, lemon juice, smoked paprika and a pinch of salt until well blended (may be made several days ahead; bring to room temperature before using). On heavy non-insulated sheet pan, toss asparagus spears with olive oil and a light sprinkle of kosher salt. Bake for 8 minutes (10 if you like your spears very tender), then immediately remove spears onto serving platter to keep them from cooking further. When cooled to room temperature ( if made the day ahead, allow the spears to come to room temperature), drizzle yogurt sauce atop and sprinkle lightly with spice blend. Serve within the hour, as yogurt sauce may be begin to separate on standing.